IU Health | Angela M.D. A big shout out to Donna and Steve for sharing their testimonials!!! A huge shout out to Kathy Taylor who makes a great cheerleader and advocate to changing lifestyles! the trouble that I have doing it,” Henriksen says. She wanted a way to help patients take responsibility for their own health. 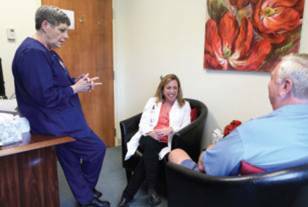 A year ago, she established a program whereby all of the practices’ patients who are interested can first see their respective physicians and then meet with medical assistant Kathy Taylor on a regular basis for wellness consultation. The wellness and lifestyle modification tips offered not only help prevent disease, according to Henriksen, but also provide cost savings in the long run by aiding with compliance issues. Taylor uses the visits to check patients’ medications, food logs and more. She also offers ideas about local resources, such as fresh fruit and vegetable delivery services. For more information, contact the office of Angela Henriksen, MD, at 317.217.2600. IU Health also offers free personal health coaching to all team members. Health coaches can help you identify ways to improve your health and/or manage your health challenges. Call 317.963.WELL.